I have no idea if there is anything in this conspiracy theory stuff. But I would be very interested to hear what others think. 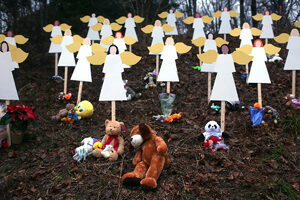 I remember as the story broke there was news of the shooter’s brother being arrested in the nearby woods. Then he’s in NJ. Then he is the shooter, and he’s dead. OK, the fog of events, I get it, but isn’t this all slightly weird? At least, bearing further credible investigation and explanation? If it’s true, it’s truly sick. Ain’t that the truth. Never know what to make of these conspiracy theories. One thing I am sure of, it would be very helpful if someone in authority stepped up and said “Ah, yes, well that’s because of this, and this is because of that …” One thing I do think about is how these rumours must make the suffering even worse for the families. I was home on the day of the massacre and followed updated news closely on my computer all day. Yes, there was considerable confusion in early reports. I think that was, as much as anything, a function of the 24-hour per day news cycle which plummets into publication without any possible fact checking. Fragments of conversation among first responders was broadcast as actual information, which was then contradicted a half hour later. Speculation was given the same weight as proven fact, and there was very little of the latter available in the early hours of the tragedy. Personally, I wish there truly were a way to remove most of these guns from our society. Paranoia plus heavy armaments assures that we will see even more tragedies like this in the future. There are no end of conspiracy theorists who weave a more or less convincing fabric around any given event or development. The simple fact that they *can* do so doesn’t mean that their musings have any credence or add anything of value to the wider conversation. They start from the assumption that there is a conspiracy, and that the world is controlled by a few devious and powerful people, and then they build their case on that. It’s kind of like if you decide you want a red car (or a conspiracy), you then start seeing any number of red cars (or conspiracies) around that you’d not otherwise notice, and you conclude that there’s a red-car (or conspiracy) surge. There is always conflicting information around any major event, and there’re always people who see “facts” in the dust storm that seem to get buried by “the authorities” later. “Heat of the moment” eyewitnesses are notoriously unreliable, including professionally trained people. So while it may assuage some people for “the authorities” to go through point-by-point to explain the apparent aberrations, the more likely fact is that they have more pressing and significant things to devote their attention to (and the conspiracy folks wouldn’t believe them anyway). The bottom line for me is that the notion of black ops teams going around the country to perpetrate outrageous atrocities on civilians is the stuff of fantasy. Think about what it would take to do that and keep it under wraps. While history is filled with amazing actions that were thought impossible (e.g., Alexander’s flying soldiers), that ain’t where the smart money bets. I can address one issue – the confusion between Ryan and Adam resulted from the fact that Adam was carrying an ID which belonged to Ryan. Why? Speculation – Adam was under 21 so Ryan’s ID opened some doors to him. Conspiracy theorists find it difficult to accept that not only do a lot of more or less crazy people live in the USA but that the theorists themselves are among them. And it truly is worse than it was, say, in the 1950s. My take is that polluted air and water and food is taking a toll on us. Not a conspiracy, just the natural result of putting wealth above everything else. Recently I saw the statistic that air pollution alone now kills about 3.2 million people per year. It seems rash to assume that it has no effect whatsoever on those who are not killed. Anoxia is known to affect the brain. I’ll leave it at that – it’s just my opinion. As to the picture of an entire population being oxygen starved, that’s scary. I was in Beijing once and got asthma walking two blocks. One day people will return to the issue of air pollution with seriousness, I trust. Bizarre health tip of the year … well, tips.